I’ve never written a post about two films at once before, but today I am writing about two films that cry out for that treatment. 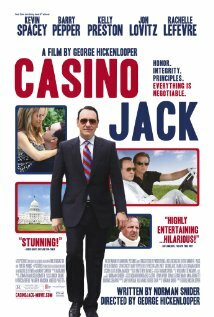 Casino Jack (feature film, 2010) and Casino Jack and the United States of Money (documentary, 2010) cover much the same territory, and each of them is incomplete. Together, however, they offer a disgusting but nevertheless fascinating trip into the world of Washington politics and the career of lobbyist Jack Abramoff. Abramoff was a former College Republican who dabbled in screenwriting and movie production until he discovered the calling that would make him infamous: he became a Washington lobbyist. In 2004 the Senate Indian Affairs Committee began to investigate his dealings on behalf of several American Indian tribes and casinos, and a sordid tale involving gambling, tribes, offshore sweatshops, lots and lots of money, murder, the Mob, and figures close to the Bush White House unravelled before the horrified members of Congress, many of whom had benefitted from Abramoff’s largesse. Convicted in 2008 of trading meals, pricey gifts, and travel in exchange for political favors, Jack Abramoff made yet another trade in exchange for a prison sentence of only four years: he agreed to cooperate with a massive bribery investigation of lawmakers, their staff, and figures in the Bush Administration. Ultimately 21 people either plead guilty or were convicted in the subsequent trials. The documentary, written and produced by Alex Gibney, is a meticulous account of l’affaire Abramoff, including interviews with all the players in that drama. It lacks only one essential thing for real understanding: Abramoff himself refused to be interviewed. His motives, and his reflections after the fact remain a question. We are left to wonder why a person who initially had high ideals and remarkable gifts of persuasion chose to invest his gifts in a con. The weakness of the feature is that it attempts to stuff the voluminous details of a complicated political episode into 108 minutes of entertainment film. Critics didn’t like it, and neither did the public, so the film appeared at the box office and faded from view almost immediately. That’s a shame, really, because the story itself is an important one. 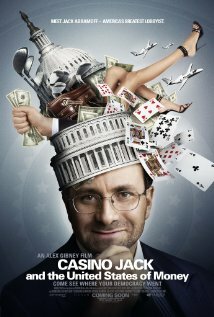 The feature film left me with the impression that Abramoff did what he did because he got caught up in the game of finding ways to persuade people to give him their money. He may also have been looking for validation of his own worth in money and in the respect or fear of important men. Spacey’s performance gave me an impression of a vain, silly man who was good at intimidating others and impressing himself, but who was at heart an empty shell. Abramoff justified his actions with his philanthropy, and his Orthodox Jewish lifestyle. His view of himself as a virtuous man completely blinded him to his despicable acts. An interview since his release from prison in 2010 suggests that perhaps he now understands that studying Torah does not make up for a failure to live Torah. One key to his side into criminal behavior is mentioned in the documentary: during his years with the College Republicans, there was a belief that since they were on the side of right, any behavior on its behalf was therefore right. “Politics is war,” and the winners would write history. Abramoff was rewarded as a young man for winning at all costs, and so it never occurred to him to ask uncomfortable questions later, when “winning” had become defined by his bank account. Taken together, these films provide a deeply disturbing picture of Washington. They are also a description of how a well-meaning, idealistic man could go so horribly wrong. This entry was posted in United States and tagged American Jewish History, Documentary, Ethics, Jewish Values. Bookmark the permalink.